About six months or so ago, when we started feeding HDawg solid foods, we quickly learned that he did not handle dairy well. In fact he broke out in hives (they start around his mouth and crawl up to his eyes with big red welts!) every time he ingested cow's milk dairy or even if his skin came into contact with anything dairy. Same with eggs (although egg yolks are okay, the egg whites affect him). Although he's too young to be officially tested, the poor kid is at least intolerant, if not allergic, to cow's milk dairy products. I know, that's the pits, right? Because it also affected him through my breast milk, I actually had a dairy-free diet for the first few months of his life. It was torture not to be able to eat pizza or chug a glass of cold chocolate milk at night (which I do quite often!). But I learned some tricks then that I'm now passing on to H. His main allergy is to raw dairy, like cheese, milk, yogurt, ice cream, etc. He doesn't seem to have much of a problem with dairy and eggs baked into products like bread, crackers, cake, etc. So for his first birthday party, I decided to make him regular cupcakes with dairy-free icing. I combined a few different recipes and came up with my own. I think it turned out pretty well! 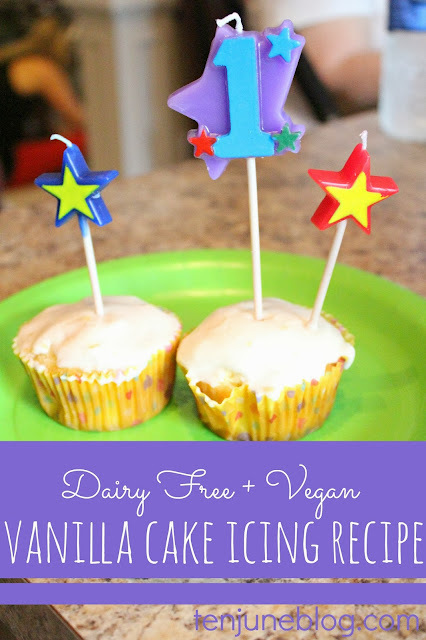 When I mentioned that I had made dairy-free icing, a few of you emailed me and requested the recipe. So here ya go! 1. Combine sugar and butter in a mixing bowl with an electric hand-mixer. The consistency will be thick and creamy. 2. Add milk and vanilla to the sugar + butter mixture. Continue to mix until smooth. And that's it! I refrigerated this mixture for about 24 hours before use and it held up well. Like any homemade icing (well, like all of my homemade icings), I think this version tastes a little sweet but it was really good. In the end, it only gets a B from me because I didn't like the vegan butter flavor, but it was certainly a sweet treat for my sweet HDawg. 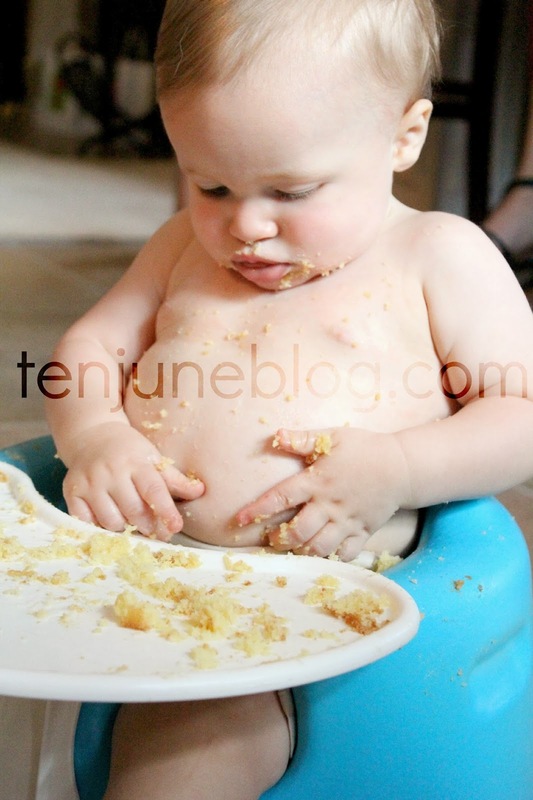 In fact, as I shared before, he loved the cake and icing so much that he rubbed it all over his belly! Get in mah belllyyyy. I actually went vegan for a while because it was easier on my digestive system - and then later found out that I had a dairy and egg allergy. My allergist told me that it actually has to do with the protein in the milk and eggs. He recommended that I try hard cheeses (the longer it sits, the more protein broken down) and eggs that have been cooked at a certain temperature for a certain amount of time (ex. hard-boiled and baked into cakes). If you're interested in cooking vegan, a great cook book to start with is Vegan with a Vengeance (and then for dessert, try Vegan Cupcakes Take Over the World). Isa Chandra Moskowitz also includes some recipes on her website (http://www.theppk.com/) that are great to start off with. My youngest has a casein (protein found in dairy products) sensitivity. She too has a sensitivity to egg whites, but not egg yolks. And yes, several things change when they are cooked. She can't eat raw apples and onions, but can eat cooked ones. The cooking changing the chemical makeup. I live in Atlanta too, my 8 month old gets hives from milk and eggs.... And following allergy testing we also found out he is allergic to peanuts. Anyway we saw Dr. Sedu (my spelling is probably incorrect) at omni allergy. He was awesome, the testing was easy. They saw my son at 7 months so I'm sure they would see h-dawg. Getting the testing done gave us piece of mind.